For existing William M. Bird customers only. August 4, 2017 — Charleston, South Carolina — Southern Diversified Distributors, Inc., the parent company of William M. Bird and TranSouth Logistics, placed 7th out of 28 in the large company category for the Best Places to Work in South Carolina. 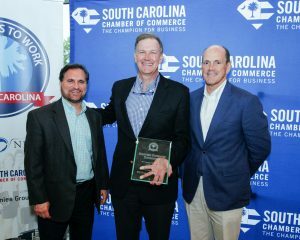 The annual program was created by SC Biz News in partnership with the South Carolina Chamber of Commerce and Best Companies Group. This is the third consecutive year Southern Diversified Distributors has been recognized on the list, but its first year in the large company category. The survey and awards program was designed to identify and honor the best employers in the state of South Carolina. The ranking process included evaluating each nominated company’s workplace policies, practices, philosophy, systems, and demographics. Additionally, it consisted of an employee survey to measure employee’s experience with leadership and management, corporate culture, communication, growth opportunities, and overall satisfaction with their job and company. Headquartered in Charleston, SC, Southern Diversified Distributors provides financial management, human resources, and information technology support for its subsidiaries, William M. Bird and TranSouth Logistics. Through these companies, Southern Diversified Distributors also develops and markets private label flooring brands Palmetto Road, Azalea Lane, and East Bay Supply Co. Together, Southern Diversified Distributors and its subsidiaries employ 275 associates in 11 locations throughout the Southeastern United States. For more information on Southern Diversified Distributors and its subsidiaries, please visit sddholdings.com.